IMPECCABLE & IMMACULATE BEST DESCRIBES THIS NEW GORGEOUS 5 BR, 4.5 BA MOVE IN READY HOME LOCATED IN THE MOST SOUGHT AFTER ROCKDALE COUNTY! 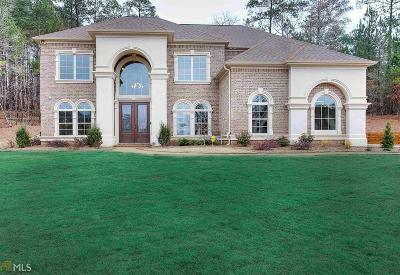 FEATURES A THEATER ROOM, ELEGANT UPGRADED TRIM THROUGHOUT, BEAUTIFUL HARDWOOD LOCATED IN THE TWO STORY FOYER, FORMAL STAIRCASE W/ WROUGHT IRON PICKETS, DINING RM, FAMILY RM & KITCHEN. ENTERTAIN YOUR GUEST IN YOUR LOVELY FAMILY RM WITH COFFERED CEILING & GRAND WINDOWS OVER LOOKING YOUR GOURMET KITCHEN WITH A LARGE ISLAND WITH BREAKFAST BAR, DECORATIVE CABINETRY, GRANITE COUNTERTOPS, SS APPL. (COOKTOP, DISHWASHER, BUILT-IN OVEN & MICROWAVE),TILE BACKSPLASH! RETIRE FOR THE EVENING IN YOUR AMAZING MASTER SUITE W/ SITTING RM THAT BOAST TRANQUILITY! JETTED TUB, TILE SHOWER, KING HEIGHT DBL VANITY & OVERSIZED OWNER&apos;S CLOSET! Directions: I-20 East To Exit 82 Turn Right. Continue To 4th Light, Turn Right Onto Hwy 138. Go Approx. 4 Miles And Turn Left On Hwy 212. Go Approx. 1 Mile, Turn Right On Tucker Mill Road (Blinking Yellow Light). Community Is On Your Left- Montclair.